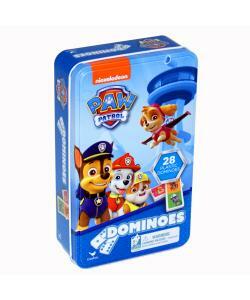 There are 28 dominoes featuring all your favourite Paw Patrol characters. 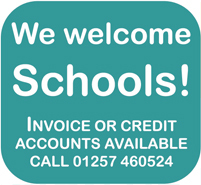 The numbers have been replaced by pictures so that young children can play the dominoes game and interact with the characters as they play and every tile is brightly coloured to make the game even more fun for your child. 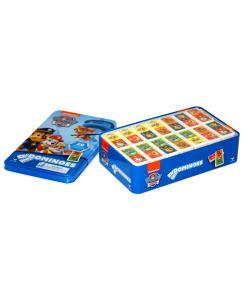 The first player to get rid of all their dominoes in the winner! 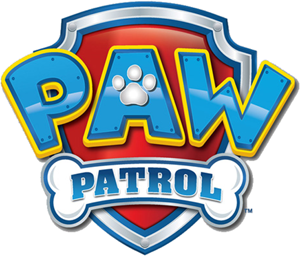 It's dominoes with a Paw Patrol twist, to keep children entertained while they learn - encouraging observation and matching skills. You begin by putting the dominoes, face-down on a table or floor and shuffling them. Each player picks 5 tiles. Place the remaining tiles - face down - in a pile. The player with two identical pictures on a domino6 places this in the centre, and the game begins. The next player - to the players left - tries to match one of his tiles with the one in the centre. The game continues in this way as each player takes a turn to try to create a chain of tiles. If you cannot place an identical tile down then you have to pick up a title from the stack. Tiles can only be placed at the start or end of other tiles to keep the chain going on. The 1st player to place all his tiles, wins!